در این پژوهش، امکان استفاده از فناوری اکستروژن در تولید مکمل فیبری فراسودمند از فراورده‌های جانبی صنایع تبدیلی گوجه‌فرنگی و برنج (تفالۀ گوجه‌فرنگی و سبوس‌ برنج) بررسی شد. از طرح مرکب مرکزی چرخش‌پذیر به‌منظور ارزیابی متغیرهای فرایند و فرمولاسیون شامل سرعت چرخش مارپیچ (160-120 دور بر دقیقه)‌‌‌‌، رطوبت (18-12 درصد) و نسبت تفالۀ گوجه‌فرنگی به سبوس ‌برنج (50:50، 25:75 و 75:25 درصد وزنی:وزنی) استفاده شد و ویژگی‌های عملکردی و فیزیکوشیمیایی شامل شاخص جذب آب، تورم‌‌‌‌، میزان سختی و فیبر رژیمی محلول فراوردۀ بافت‌داده‌شده موردارزیابی قرار گرفت. نتایج نشان داد که با افزایش همزمان متغیرهای سرعت چرخش مارپیچ و نسبت تفالۀ گوجه‌فرنگی به سبوس ‌برنج‌‌‌‌، شاخص جذب آب فراورده افزایش یافت. افزایش همزمان رطوبت و نسبت تفالۀ گوجه‌فرنگی به سبوس‌ برنج میزان تورم را افزایش داد. سختی بافت مکمل فیبری با افزایش سطوح افزودن تفالۀ گوجه‌فرنگی به سبوس ‌برنج افزایش یافت و افزایش سرعت چرخش مارپیچ سبب افزایش میزان فیبر رژیمی محلول گردید. مطابق نتایج به‌دست‌آمده در تحقیق حاضر، شرایط بهینۀ فراوری مکمل فیبری در شرایط تحت بررسی با اهداف افزایش شاخص جذب آب، تورم، میزان فیبر رژیمی محلول و کاهش سختی شامل شاخص جذب آب 4/64 گرم بر گرم، میزان تورم 4/61 میلی‌لیتر بر گرم، میزان سختی 89/08 نیوتن، فیبر رژیمی محلول 11/09 درصد، میزان رطوبت خوراک 14/06 درصد، نسبت تفالۀ گوجه‌‌فرنگی به سبوس‌ برنج 26/43 درصد و سرعت چرخش مارپیچ 120 دور بر دقیقه، تعیین گردید. AACC. 2000. Approved Methods of the American Association of cereal Chemists. 10th ed. St.Paul, Minnesota: American Association of cereal Chemist. Altan, A., Mccarthy, K.L., & Maskan, M. 2009. Effect of Extrusion cooking on Functional properties and in Vitro starch Digestibility of Barly-Based- Extrudates from fruit and vegetable By-Products. Journal of Food Science, 74:86-77. AOAC. Official methods of analyses. 2000. Association of Official Analycal Chemists, Washington, DC. Bach Knudsen, K.E. 2001. The nutritional significance of dietary fiber analysis.Animal Feed Science and Technology, 90(1-2):3-20. Chandi, G.K., & Sogi, D.S. 2007. Functional properties of rice bran protein concentrates. Journal of Food Engineering, 79(2):592-597. Chang, Y.K., Martinez-Bustos, F., & Lara, H. 1998. Effect of some extrusion variable on rheological properties and physicochemical changes of cornmeal extruded by twin screw extruder. Brazilian Journal of chemical Engineering, 15(4):370-381. Charunuch, C., Limsangouan, N., Prasert, W., & Wongkrajang, K. 2014. Optimization of extrusion conditions for ready- to- eat breakfast cereal enhanced with defatted rice bran. International Food Research Journal, 21(2):713-722. Daou, C., & Zhang, H. 2011. Physico- chemical properties and Antioxidant Activities of Dietary fiber Derived from Deffatted Rice Bran. Advance Journal of Food Science and Technology, 3(5):339-347. Davies, J.N., & Hobson, G.E. 1981. The constituents of tomato fruit: the influence of environment, nutrition, and genotype. Critical Reviews in Food Science and Nutrition, 15:205-208. Dhingra, D., Michael, M., & Rajput, H. 2012. Dietary fibre in foods: a review. Food science and Technology, 49(3):255-266. Dhungana, P., Chauhan, A., & Sing, S. 2014. Evaluation of extrudate from sweetpotato flour and tomato pomace blend by extrusion processing. African Journal of Food Science, 8(5):246-277. FDA. 2005. 21 CFRPart 101. Food labeling: Health clams; solouble dietary fiber from certain foods and coronary heart. Federal Register, 70:246. Galdeano, M.C., & Grossmann, M.V.E. 2005. Effect of treatman with alkaline hydrogen peroxide associated with extrusion color and hydration properties of oat hulls. Brazilian Archives of Biology Technology, 48(1):63-72. Gould, J.M. 1989.Alkaline peroxide Treatment of Agricultural By products. USP Patent, 4:806-475. Grigelmo-Miguel, M., Gorinstein, S., & Martin-Belloso, O. 1999. Characterization of peach dietary fiber concentrate as a food ingredient. Food Chemistry, 65(2):175-181. 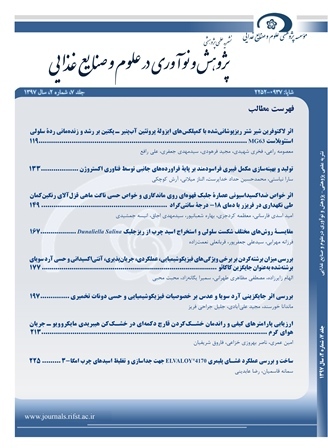 Hematian Sourki, A., Mahdavian Mehr, H., Pourfarzad, A., & Sedaghat, N. 2013. Optimization of alkaline extraction for dietary fiber of coffee silver skin and its effect on the quality and shelf life of Iranian Barbari bread. Journal of Nutrition Sciences and Food Technology, 1(30):11-22. Huang, Y., & Ma, Y. 2016. The of effect extrusion processing on the physicochemical properties of extruded orange pomace. Food Chemistry, 192:363-369. Jing, Y., & Chi, Y. 2013. Effect of twin-screw extrusion in soluble dietary fibre and physicochemical properties of soybean residue. Food Chemistry, 138:889-884. Kim, C.J., Byun, S.M., Cheigh, H.S., & Kwon, T.W. 1987. Optimization of Extrusion Rice bran stabilization process. Journal of Food Science, 52(5):1355-1357. Kosseva, M.R. 2013. Food Industry Wastes. 1st ed. Academic Press, Elsevier, San Diego, USA. Kumar, N., Sarkar, B.C., & Sharma, H.K. 2010. Development and Characterization of Extruded product using Carrot pomace and Rice Flour. International Journal of Food Engineering, 6(3):1-24. Larrea, M.A., Chang, Y.K., & Martinez-Bustos, F. 2005. Some functional properties of extruded orange pulp and its effect on the quality of cookies. LWT-Food Science and Technology, 38(3):213-220. Lopez, G., Ros, G., Rincon, F., Perigo, M.J., Martinez, M.C., & Ortuno, J. 1996. Relationship between physical and Hydration properties of Soluble and Insoluble fiber of Artichoke. Journal of Agriculture and Food chemistry, 44(9):2773-2778. Lue, S., Hsieh, F., & Huff, H.E. 1991. Extrusion cooking of corn meal and suger beet fiber:effects on expansion properties, starch gelatinization, and dietary fiber content. Cereal Chemistry, 68(3):227-234. Lyly, M., Salmenkallio-Marttila, M., Suortti, T., Autio, k., Poutanen, K., & Lahteenmaki, L. 2004. The sensory characteristics and rheoligical properties of soups containing oat and barley ß- glucan before and after freezing. LWT- Food Science and Technology, 37(7):749-761. Manilal, P.P. 2005. Super critical fluid extraction of rice bran with adsorption on rice hull ash. P. 1-170. Thesis of Master of Science of Louisiana State University and Agricultural and Mechanical college. Mansour, E.M., & Khalil, A.H. 1997. Characteristics of low- fat beefburger as influenced by various types of wheat fibers. Food Research International, 30(3-4):199-205. Martinez-Bustos, F., Viveros-Contreras, R., Galicia-Garcia, T., Nabeshima, E.H., & Verdalet-Guzman, I. 2010. Some Functional characteristics of extruded blends of fiber from sugarcane bagass, Whey protein concentrate, and corn starch. Food Science and Technology, 31(4):870-878. Mendez-Garcia, S., Martinez-Flores, H.E., & Marales-Sanchez, E. 2011. Effect of extrusion parameters on some properties of dietary fiber from lemon (citrus aurantifolia swingle) residues. African Journal of Biotechnology, 10(73):16589-16593. Moraru, C.I., & Kokini, J.L. 2003. Nucleation and expansion during extrusion and microwave heating of cereal foods. Comprehensive Reviews in Food Science and Food Safety, 2:147-165. Moscicki, L. 2011. Extrusion-cooking techniques. application, theory and sustainability weiheim germany: Wiley- VCH Verlage GmbH. Ning, L, Villota, R., & Artz, W.E. 1991. Modification of corn Fiber through chemical treatments in combination with twin- screw extrysion. Creal Chemistery, 68(6):632-636. O’Shea, N., Arendt, E., & Gallagher, E. 2013. Enhancing an extruded puffed snack by optimising die head temperature, screw speed and apple pomace inclusion. Food and Bioprocess Technology, 7(6):1767-1782. Potter, R., Stojceska, V., & Plunkett, A. 2013. The use of fruit powders in extruded snacks suitable for children’s diets. LWT-Food Science and Technology, 51(2):537-544. Prosky, L., Asp, N.G., Scheweizer, T.F., Devaries, J.W., & Furda, I. 1988. Determination of insoluble, soluble, and total dietary fibre in foods and food products: interlaboratory study. Journal of Official Analytical Chemists, 71:1017-1023. Ralet, M.C., Thibault, J.F., & Della Valle, G. 1991. Solubilization of Suger- beet pulp cell wall polysaccharids by extrusion- cooking. Lebensmittel-Wissenschaft und-Technology, 24(2):107-112. Rashid, S. 2015. Effect of extrusion cooking on the dietary fibre content and water solubility Index of wheat bran extrudates. Food Science and Technology, 50(7):1533-1537. Regand, A., & Goff, H.D. 2003. Structure and ice recrystallization in frozen stabilized ice cream model systems. Food Hydrocolloids, 17(1):95-102. Robertson, J.A., de Moredon, F.D., Dysseler, P., Guillon, F., Amado, R., &Thibault, J.F. 2000. Hydration properties of dietary fiber and resistant starch: a European collaborative study. LWT-Food Science and Technology, 33(2):72-79. Rouilly, A., Jord, J., & Rigal, L. 2006. Thermo-mechanical processing of sugar beet pulp. Carbohydrate Polymers, 66(1):81-87. Selan, M.M., & Brazaca, S. 2014. Characterisation and potential application of pinapple pomace in an extruded product for fiber enhancement. Food Chemistry, 163:23-30. Selani, M.M., Brazaca, S.G.C., Dias, C.T.D., Ratnayake, W.S., Flors, R.A., & Bianchini, A. 2014. Characterisation and potential application of pineapple pomace in a extruded product for fibre enhancement. Food Chemistry, 163:23-30. Soukoulis, C., Lebesi, D., & Tzia, C. 2009. Enrichment of rice cream with dietary fibre: Effect on rheological properties, ice crystallization and glass transition phenomena. Food Chemistry, 115:665-671. Stojceska, V., Ainsworth, P., Plunkett, A., & Ibanoglu, S. 2010. The advantage of using extrusion processing for increasing dietary fiber level in gluten- free products. Journal of Food Chemistry, 121(1): 156- 164. Thebaudin, J.Y., Lefebvre, A.C., Harrington, M., & Bourgeois, C.M. 1997. Dietary fiberes: nutritional and technological interest. Trends Food Science and Technology, 8(2):41-48. Thuwapanichayanan. R, Prachayawarakorn. S., & Soponronnarit, S. 2008. Drying characteristics and quality of banana foam mat, Journal of Food Engineering, 86:573-583. Wang, W.M., Klopfenstein, C.F, & Ponte, G. 1993. Effects of twin-screw extrusion on the physical properties of dietary fiber and other components of whole wheat and wheat bran and on the baking quality of the wheat bran. Cereal Chemistry, 70(6):707-711. Wong, K.H., & Cheung, P.C.K. 2004. Dietary fibers from mushroom sclerotia: preparation and physicochemical and functional properties. Journal of Agriculture and Food chemistry, 53(24):9395-9400. Yagci, S., & Gogus, F. 2008. Response surface methodology for evaluation of physical and functional properties of extruded snack foods developed from food- by- products. Journalof Food Engineering, 86(1):122-132. Yangilar, F. 2013. The application of dietary fibre in food industry: structural features, effects on health and definition, obtaining and analysis of dietary fibre: a review. Journal of Food and Nutrition Research, 1(3):13-23. Zhang, M., Bai, X., & Zhang, Z. 2011. Extrusion process improve the functionality of soluble dietary fiber in oat bran.Journal of Cereal Science, 54(1):103-98. Zhang, M., Liang, Y., Pei, Y., Gao, W., & Zhang, Z. 2009. Effect of process on physicochemical properties of oat bran soluble dietary fiber. Journal of Food Science, 74(8):28-36. Zhang, Y., Feng, Y., Sun, L., & Wang, D.W. 2010. Optimization of extrusion technology of rice bran by response surface methodology and measurement of its physicalproperties. Food Science, 20.